Get ready for Spring with Neon Eggs! Wow! Checkout the fun bright neon colored eggs on this spring card by Danielle. She used our fun cracked eggs from our Easter Scramble stamp set stamped them in fun bright neon colors. Then she added the cute chick to one of them! The fun background and sunshine and clouds sets a perfect scene for this fun, cheery spring card! I know I'm definitely ready for a sunshiny spring day! 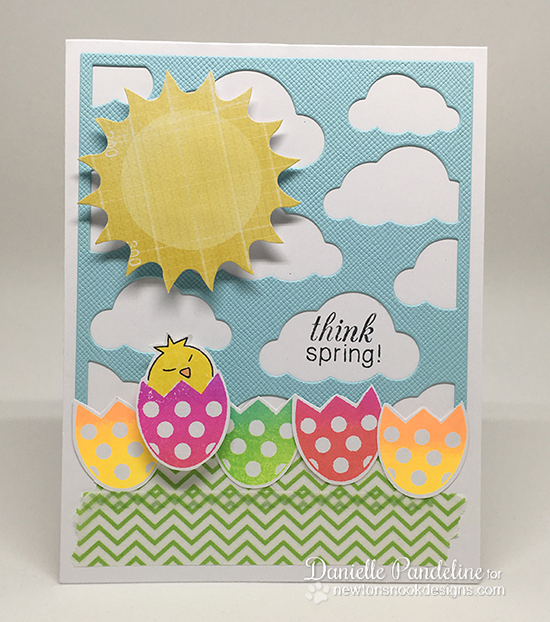 The "think spring" sentiment is also from the Easter Scramble stamp set ! To see more fun creations by Danielle you can head over her blog, GirlRacerScrap and say hello! Those neon eggs are fabulous, as is the wee chick making his appearance into the sunny scene! Such fun! Neat card. I like how you created the cloud background. What a beautiful, bright, FUN card, love it! What a sweet card! SO cute! Super cute card! Love the die cut sky background!